By Rob Smith: IBF/IBO/WBA/WBO heavyweight champion Wladimir Klitschko (59-3, 50 KO’s) had his way with a totally overmatched and painfully slow Mariusz Wach (27-1, 15 KO’s) tonight in winning a 12 round unanimous decision by the scores of 120-107, 120-107 and 119-109 at the O2 World Arena, Altona, in Hamburg, Germany. Wladimir used jabs and right hands to control the slow moving, slow punching Wach. Other than in the 5th where Wach seemed to have stunned Wladimir with a right hand, it was totally one-sided with Wladimir teeing off on Wach. 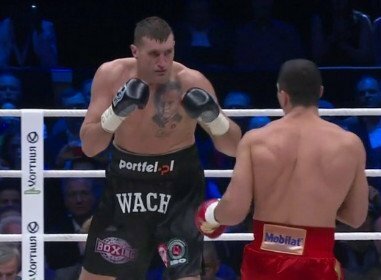 The fight became really one-sided from the 8th round, as Wladimir unloaded on Wach with combinations and it looked like Wach was ready to be stopped. However, Wladimir failed to follow up in the 9th because Wach looked totally ready to go. Wach was only capable of landing an occasional right hand as he just looked unwilling to let his hands go for some reason. He did try at times but mostly missed badly because of his slow hand speed. Wladimir looked okay but he lacked the killer instinct as he played it safe in the last quarter of the fight. He did what he had to do in order win but it wasn’t impressive stuff. This is the kind of thing that boxing fans hate about him. He plays it safe too much and ends up winning boring fights. Wach totally underperformed and it’s too bad. He came all the way to Germany and then fought passively. I doubt he’ll ever get a world title shot again and it’s bad this is all he could do.